Surfers Dream Poolside 2 bedroom Condo Next to Cocoa Beach Pier! We love this ground floor Ocean/Poolside Surfers Dream 2 bedroom, 2 bath condo unit that Sleeps 5, located in Chateau By the Sea Building for its proximity to the famous Cocoa Beach Pier and its modern and fun decor and bright living space. The condo has Gorgeous tile throughout. You are literally 10 steps from the pool & beach access, all just outside this condos sliding glass door. Chateau by the Sea is located next to the Cocoa Beach Pier just steps away from the sand. 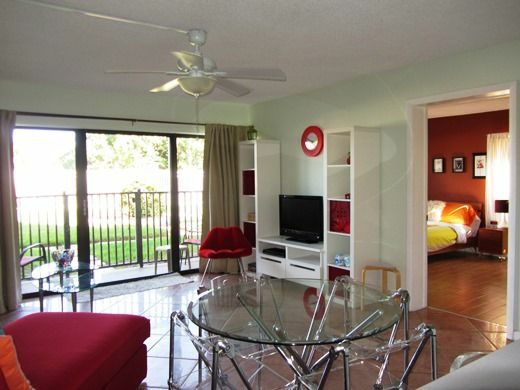 This is a great ground floor unit that is fun and bright with lots of windows. This property opens right to the pool and you can walk to the Pier. Walking distance to live music and lots of restaurants. Only for guest in the complex. The condo was awesome and in a perfect location loved the easy beach access. Grounds are beautiful and well maintained. You cannot beat the location, pool and beach steps from the back patio. Very responsive owner. This was a great start to our vacation! Overall we had a nice experience with the condo. It was clean and had everything you need in the kitchen. It is a good value for the money and the area around the condo has a lot to offer. ThBeach was less than 50 yds away. The beach is public and gets very busy after 10am. We went early and then came back later after it quieted down. Pool is nice. Cocoa Beach pier is very close and offers food and drinks + fishing. Thank you for your kind review, we hope to see you back to Cocoa Beach in the future! lso, Cocoa Beach Pier was a plus. Property was nice, location not so great for us. The property was clean and well kept. A plus was a separate bathroom for our teenage son. It would have been nice if they left us a roll of paper towels, but that's just a minor thing. We could never figure out how to get the T.V. in the master bedroom to work with the cable service, but we figured out the main T.V. There seemed to be a missing remote in the bedroom. The wifi was easy to use and the keyless entry was a plus. Our main gripe was the area. Although it's close to the beach and the Coco Beach Pier is very nearby, it tended to be so close that the beach was always crowded. If I were in college, I would have loved it, but I have teenage son, and we are not into bar hopping or visiting gentlemen's clubs. There were plenty of those within walking distance. There just was not enough "family oriented" walkable places for us, and no onsite amenities other than a very small pool. We also did not see a code for the gate into the pool, and had to walk around to a side door to get into the front door, so we had to sweep up sand a lot if we went out to the beach. Also, the renter should have told us what was expected of us before we took the rental. Its customary for rentals like these to want us to take care of our dirty dishes and dump the trash, but not wash and dry the towels or get penalized. We left the afternoon before rather than get up at 6 am to take showers so that we could have washed the towels,and we are just three people. The washer was a little one, and took an hour to wash and an hour to dry. Isn't that what the cleaning fee is for? Another disclosure that would have been nice would have been the fact that they are working on the property and many of the parking spots are taken up with contractors equipment. We are Centrally Located; you can walk to the Cocoa Beach Pier and enjoy drinks or dinner with live music. Also the world famous Ron Jon's Surf Shop is just minutes away. Watch the cruise ships depart at Port Canaveral, just 1.5 miles to the north. The casino cruises set sail several times a day and offer free food and drinks.